U-Reach Data Solutions Inc.: Is Hammering the HDD the Best Way To Secure Data? Is Hammering the HDD the Best Way To Secure Data? One of the hottest issues in data security is HDD data protection. 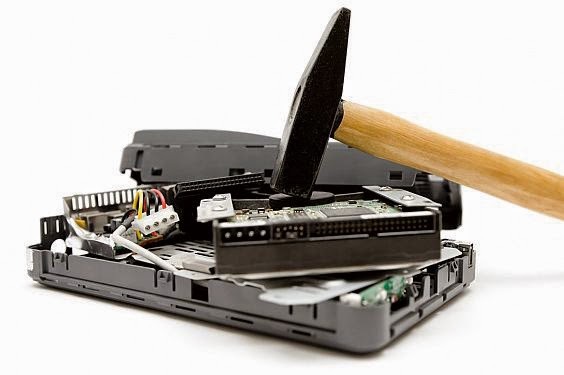 Till now, some people believe the best way to make HDD data disappeared is using a hammer to destroy it. However, in most of cases, a hammer can no more than damage the casing. After reviewing a few successful cases of data recovery, it is quite amazing to see how easily experts are able to recover data, even if the hard drive is badly damaged. The most famous case is that of a leading Japanese information and communication technology (ICT) company, Fujitsu. Before being acquired by Toshiba, Fujitsu was able to recover data from a drilled HDD. Two circumstances now also influence HDD data protection — awareness of environmental protection & the emergence of the solid state hybrid drive. In short, the former contributes to HDD recycle and reuse, and the latter compels us to search for more creative alternatives rather than relying on the “Hi-Tech solution” of magnetizing hard drives. Hammering the HDD does not equate “data security”, and therefore is not able to guarantee data safety. Similarly with the solid state hybrid drive, if users do not destroy the Nand-Flash inside thoroughly, there is still opportunities for data recovery. Therefore, if you’d like to choose a green & effective way to destroy all worthless and sensitive HDD data, a hammer is not the way to go.